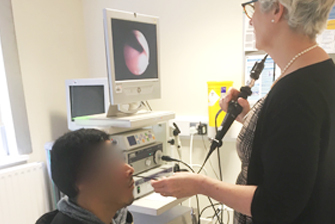 This is a procedure done in outpatients to look at the larynx to diagnose the cause of voice problems. The flexible tube is inserted through the nose and passed into the back of the throat. This allows a good view of the larynx with the patient awake, it also allows assessment of movement and function. 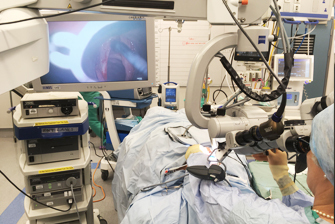 A version of the nasendoscopy can be used to assess swallowing problems. It is not usually necessary to use any anaesthetic but in some cases a numbing spray may be helpful. This procedure is also done in outpatients it involves a rigid tube being passed into the mouth towards the back of the tongue. The lens is usually at an angle of 70degrees which gives a good view of the larynx. Most people do not need anaesthetic but some patients have a strong gag reflex so a numbing spray can be helpful. As the tube is slid into the mouth the Doctor will hold onto the patient’s tongue. This will normally give a very good view of the larynx particularly important when there are subtle changes. 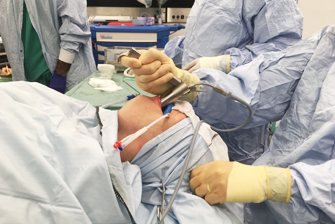 This is a procedure to look at the larynx when the patient is asleep under general anaesthetic. It involves putting a metal tube(scope) through the mouth to the larynx and then using a microscope to look in detail at the vocal cords. This will then allow very precise surgery on the vocal cords to allow treatment for vocal cord problems. The main risks of the procedure are getting a sore throat, bruising of the tongue or lips, numbness of the tongue and very rarely damage to the teeth. 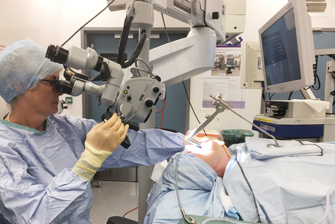 Most patients having a microlaryngoscopy will need to rest their voice for up to 2 weeks after the surgery. For this reason we normally recommend that patients will have 2 weeks off work, for singers and actors that may be longer.